LOKOJA – Ahead of the 2019 general election, the Presidential candidate of the All Progressives Congress (APC) shook Kogi State on Wednesday as unprecedented mammoth crowds welcome him to the state for his campaign. The 25,000 sitting capacity stadium was filled to the brim, while the track and field space as well as the stadium surroundings were flooded with party faithfuls, supporters and sympathizers of the President. Speaking at the rally, President Muhammedu Buhari said it will be a great mistake to return PDP candidates at any level back to government. He said his government will work towards making Ajaokuta steel work, said the completion of Ajaokuta steel will ensure massive employment to its citizen. Buhari thank the crowd in Lokoja, Kogi State capital for coming out in such a short notice, urged the people to considered his performances inspite of the scarce resources_ to vote him for second time. He also berated the previous administrations for wasting $16 billion on power without a commensurable outcomes;said his efforts in the sectors has yielded more results than his predecessors. The Director General, of the APC Presidential Campaign Council, Rotimi Amaechi said the general election is between the looters and the looted; saying the PDP are the looters while the populace are the one being looted. “They said there is hunger in the land. Yes, there is hunger because the PDP looted everything. They want to come back and continue their looting. The state governor, Yahaya Bello said the crowd is an acceptance of the party in the state calling on the people to vote for the party in the general election. The governor promised the president that he will not only win the state but will win in all the 239 polling units in the state. The governor urged the electorates not to reinvent failure in voting any PDP candidates at any level of tiers of governments. 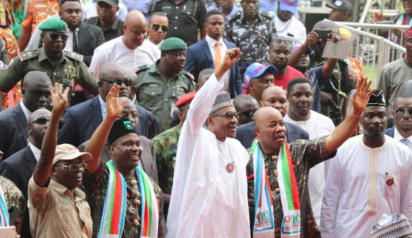 Buhari who entered into the stadium around 2:30 pm walked round the track field taking in cheers and accolades from the exited supporters who trooped out in large numbers to catch a gleams of the President.